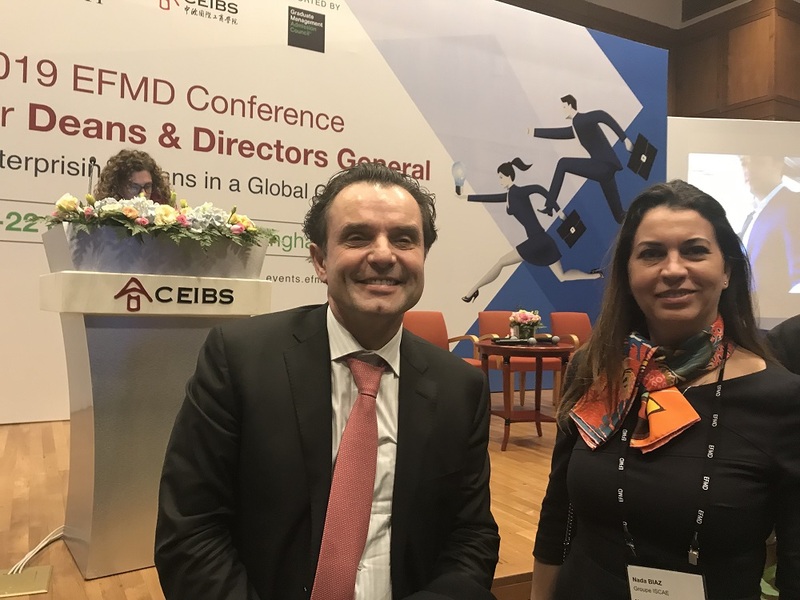 The EFMD 2019 Deans and Directors General Conference, organized in Shanghai, hosted by CEIBS, gathered about 300 delegates from 53 countries and 43 speakers from Business Schools decision makers to business world professionals. The conference was an opportunity to have the EFMD market overview, to discuss the global and specific challenges that BS face in a volatile environment, as well as to network with world-class Business Schools and meet partners. 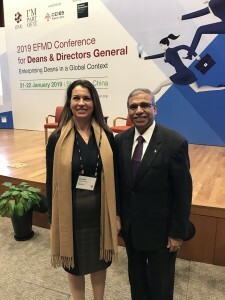 It was also the first EFMD Deans and Directors General Conference organized outside Europe. 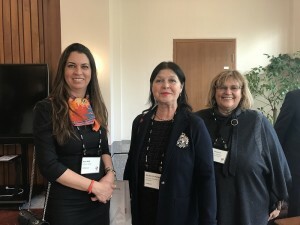 As a matter of fact, the 2019 conference put an emphasis on China’s importance in the global business world in general, and the impressive development of Chinese business schools (55 Chinese BS are EFMD members) in particular. 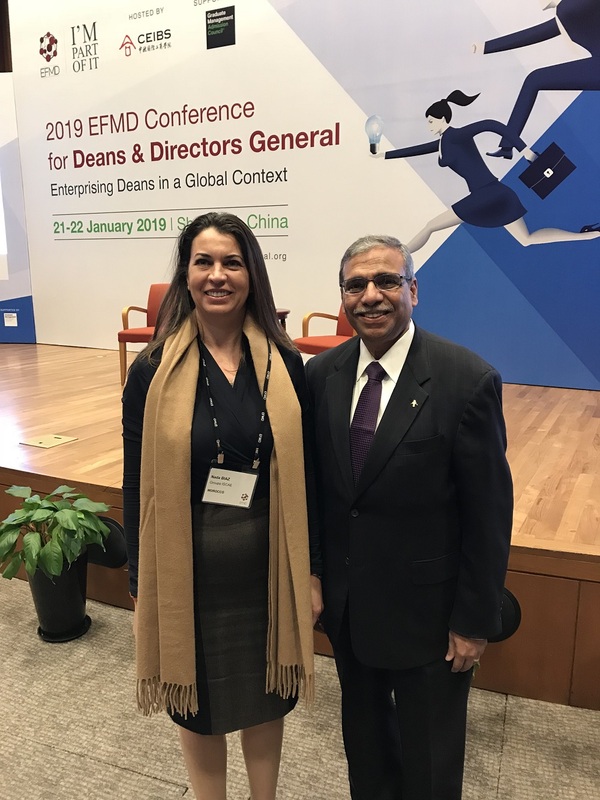 The conference offered also the opportunity to get the latest information about EFMD network that counts today 936 members in 91 countries, mostly in Europe (560) and Asia (160 with 38 EQUIS accredited BS). Also, a whole day was dedicated to explaining EFMD accreditations standards, through its quality services. Business School Impact System “BSIS” was presented as the first comprehensive tool to assess a business school impact. A special interest has been shown towards Africa (Africa-EU), as one of the international projects. Why Choose China to host the first EFMD Deans and Directors General conference out of Europe? -7 out of the top 10 MBAs are Chinese, according to 2018 rankings. So, the scene for this year conference was about the understanding of advances in management development with a China focus. China is a great example of deep reform and opening-up strategy. China’s impact in different continents, with a special interest in Africa is obviously remarkable. Impact, Diversity, and Innovation were the most redundant words that came out during the conference. Morocco was also cited many times as an opportunity market for Chinese companies. Presenting the trends of M&A for Chinese Companies Overseas shows how they went global with a great jump since 2015. Guest speakers, which were all alumni, presented their experiences as top leaders of major Chinese companies in different sectors. They shared the values and visions of their companies in very inspiring ways that prove how creative and visionary they are. Also, they have put emphasis on the digital and operation management in a growing demanding and changing market worldwide. Guest speakers gave their insights on the challenges companies are facing when it comes to integrating a new globalization strategy, how to merge two cultures and have a successful merger in the long run. Entering foreign developing or underdeveloped countries is different from entering developed countries. The approach has to be more targeted and adapted to the specificities of the country where the acquisitions are made. It’s also important to think about sustainability of globally acquired companies, before acquiring overseas. Guest speakers insisted on the respect of local history, laws and practices, as much as integrating the global trends. As one of the guest speakers from a food / fishing company said: “Fish of the world, but Chinese cuisine”. “Happiness, Wealth and Health” were the values of a lady speaker from a fashion group including the famous brand “Lanvin”. She insisted on the importance of biotechnology and the block chain because relevant transparency is a significant trend. For another Alumni, who founded his own company 25 years ago, becoming the n°1 in China Power tools (Chervon), the production market is getting more consolidated worldwide, while it is booming in China, with amazing global footprint. Impact of his company is illustrated by the phrase “Better Tools. Better World”. During the conference, attendees had also the chance to listen to influent personalities, such as Jiang Jianqing, former Chairman of the Industrial and Commercial Bank of China (ICBC), also Adjunct Professor of Finance at CEIBS, the host B.school, explaining the logic behind the evolution of international finance and the journey of China’s financial Reform. It was interesting to understand the international influence of China’s financial industry, after 40 years of reform and opening-up. He concluded by confirming the idea that digital reinvention is the definite path for developing the financial industry. -BRICS multinationals in the Fortune Global 500 have grown from 16 (in 1999) to 129 (in 2018); and according to Mc Kinsey, this will grow to 225 in 2025. -Africa as a great opportunity. So students, and consequently B. Schools, ask for more contextual material, with local content. -Digital disruption with on-line degrees, Harvard HBX, Coursera…; and for a longer term, the continuous development of Artificial Intelligence, leading to new business models. -Competitive environment for Business Education has changed with the arrival of new competitors, fragmenting the global BS market and signing the end of the “Cash Cow” Era of the MBAs, multiplying specialized programs. -Necessity of community building, connecting participants, alumni and facilitators. For at least these reasons, higher education institutions need faculty and senior managers who are empowered and ready to take on broader strategic responsibilities. But they also need leaders that are willing to enhance their professional skills while developing and growing personally. -Set a succession line, by empowering step by step, before giving full responsibility through formal appointment. Actually, a Dean or General Director should be acting as a transformational architect: by establishing a meaningful “nobler mission” for the organization, getting the right people and putting them in the right roles, translating strategy, being a role model while supporting and empowering his team members, building his legacy and developing a succession plan. About 70% of AACSB and EQUIS accredited business schools use the word “Impact” or “Influence” when defining themselves. Why are BS interested by its Impact? Is it enough to talk about impact? How is it assessed? How are BS contributing to developing human capital, society and making the world a better place? Focusing on impact helps enterprising deans to change the strategic priorities of their schools, giving more purpose to its actions and engaging more stakeholders. Regarding assessment of Impact, the main difficulties are data availability and collection, but also lack of accuracy of data or its irrelevance to express the real situation. The challenge is that it’s not obviously observed in the short term, or in one shot. It’s a continuous and consistent effort, based on formal impact evaluation processes, leading to recommendations for continuous improvement. Future actions/ projects will be then addressing societal challenges. For example, entrepreneurship structure development impact is to improve employability; professional development for faculty and administrative staff impact is to enhance sustainable transformation; opening a new campus in a specific location impacts the development of the city or the region. .Is it the Impact of Research? .Is it the Impact of Executive Education? -Impact on what or whom? -Academic Impact and Managerial Impact.